There is a lot of interest and excitement with the Eagles secondary this year, especially the CBs. How do you use Ronald Darby, Jalen Mills, Sidney Jones, Rasul Douglas, De’Vante Bausby and Avonte Maddox? Just how good can Jones be? Last year the Eagles didn’t exactly face Murderer’s Row when it came to receiving corps. This year will be different. The corners better be good because they have quite a challenge headed their way. There are several other teams who have a mixture of talented pieces that could develop into good groups. Not every one of those receivers is an elite player, but as a whole those groups are talented. You are going to have tough matchups. 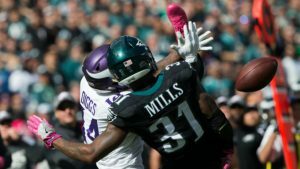 We should get an accurate read on just how good Jalen Mills is. Sidney Jones will be tested right away. Ronald Darby better be careful when jumping routes against these guys. It is a good thing the Eagles have a talented set of CBs this year. They also should have a better feel for things. Mills has a full year of starting under his belt. Darby knows the system and his teammates. Last year he was learning on the fly. Jones lacks on-field experience, but he won’t be like a normal rookie. Sitting in meetings helped him to learn the scheme and what to really expect from NFL receivers. Bausby was with the Chiefs at this time last year. Douglas was a raw rookie trying to carve out a role. He’s still trying to carve out a role, but he’s shown NFL ability and that will give his confidence a major boost. It is going to be interesting to see how the defense performs this year. There is plenty of room for optimism, but it will be a major challenge when you look at the QBs and receivers the Eagles will be facing. There are a couple of things we know about this group. They’ll be fearless. Jim Schwartz only wants DBs that are incredibly confident and who play that way. He’s got no use for a CB that always plays it safe or is scared to get burned. We also know these DBs will make plays. Schwartz pushes them to take chances. He is willing to live with mistakes as long as those moment are countered by good ones. Darby, Mills and Patrick Robinson all had at least 3 picks last year. Douglas had a pair, and he played sparingly.